I don’t know about you, but I find drawing faces really difficult – shock horror! – I can never get the proportions right and everything ends up a bit cross-eyed. So I’ve recently come across a new set of clear rubber stamps by Andrea Gomoll, which hopefully, will help me to get better at drawing faces. 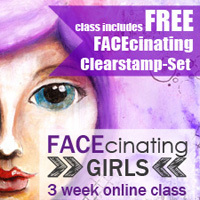 Called FACEcinating Girls, the rubber stamps are designed to go with a three week online workshop she’s also running on drawing faces. We’re currently on week one of FACEcinating Girls, with two more weeks to go. I’ve found the the videos really informative, and as with everything – I just need to get on with it. I’ll be be posting the results here soon, so look out for something that hopefully doesn’t look too much like an alien from Roswell. So go on and check out Andrea’s blog for all things FACEcinating.